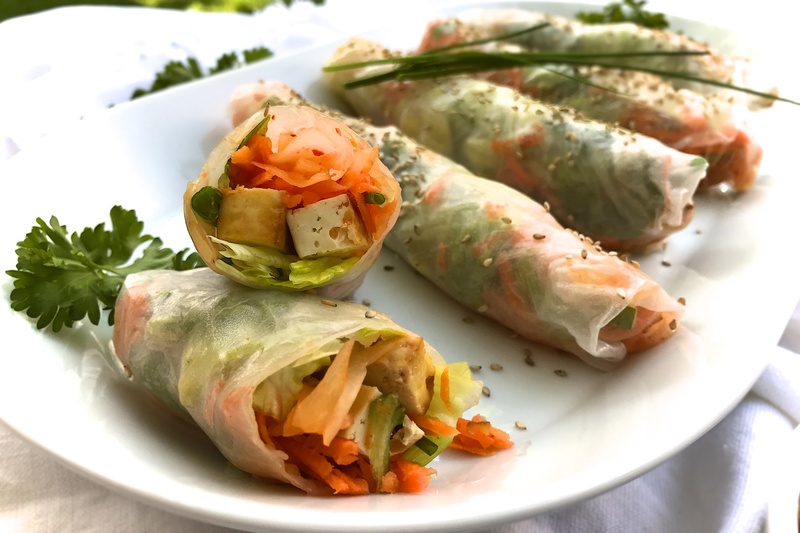 I’ve been meaning to try my hand at rice paper rolls for months and I finally got to it with these Kimchi Summer Rice Rolls and I’m super excited to tell you about it! They were an instant hit! Rolling these delicate papers might seem daunting at first, but once you get the hang of it they’re easy and fun. I highly encourage you to try this asap. This is a recipe for veggies, tofu and kimchi filling, but the options seem limitless. I’m excited about doing up some fruit-filled versions and bring a batch with soba noodles and basil and making all sorts of different dipping sauces. My focus here, though, was incorporating some fermented foods for good gut health so I went with a fresh, tart and umami experience by adding kimchi to the rolls and making a dipping sauce with miso: both of which are excellent sources of probiotics. If you want to know more about the health benefits of fermented foods check out my Fermented Foods FAQ here. Now, on with the roll show! A wanted to give you a few tips here before you get going because this will make the work flow a lot more enjoyable. 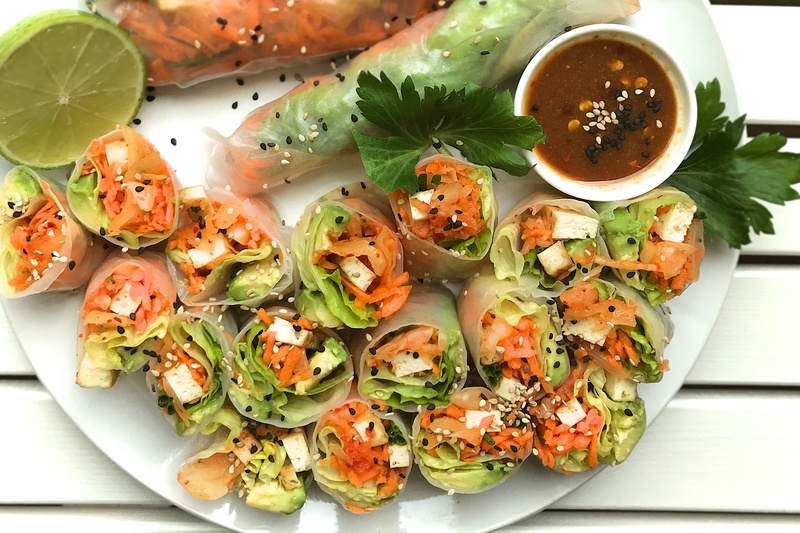 Have all your filling ingredients prepped and ready to go in one easy place because you will need to work fairly quickly with the rice paper once they are wet. 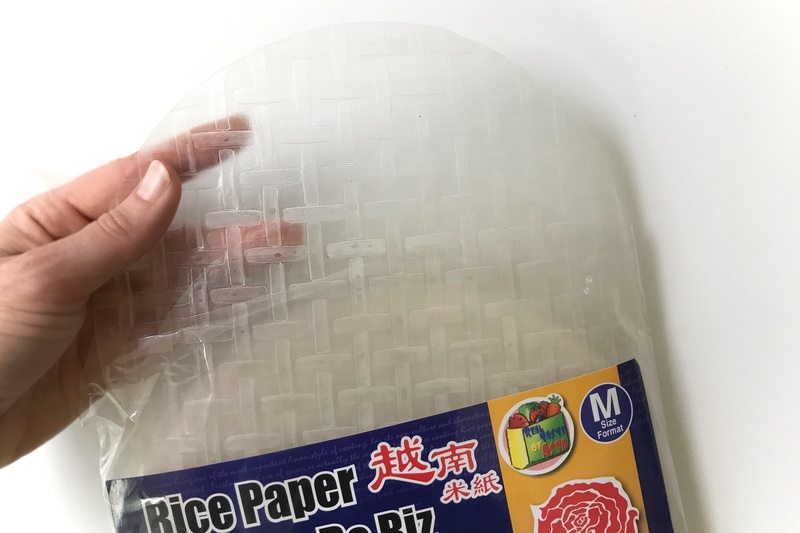 To that point, the rice papers get progressively more soggy and fragile by the second after they have been activated in warm water, so you want to work as quickly as possible to avoid ripping them. Have a bowl or pie plate with warm water to soften the papers that is, at least, as wide as the diameter of your rice paper. When you dunk the rice papers in the warm water, caress them a little to feel when they’re ready to come out. They should only need 10 seconds or so. You want them to start getting flexible, but not be a sloppy mess. I found using a clean countertop was a good surface for rolling since it was a bit grippy, but also smooth enough to pull the rolls off easily. Make sure the surface is clean and dry with each new roll you start. Have some clean tea towels handy to catch the excess water from the rice papers that have just been “bathed” in warm water. You’ll have to see what kind of rolling method works best of you, but I likened it to wrapping a mini burrito and placed the filling in the lower third of the circle and tucked the ends in about half way up. You don’t have to tuck though. If you want to cut them in half when you’re done, it helps to wet your knife. These suckers are sticky! That’s where my rolling lesson stops, because most rice paper will have a visual instruction on the package somewhere and you’ll just figure out what works best for you once you get into it. It’s fun! The recipe does NOT have to be precise, think of it like making sandwiches. If I tell you I used 1 lettuce leaf, you can use 4. Make it to your preference. Consider this a guide. I like to bake my tofu, so I baked the whole block before starting to roll. You’ll likely only use 1/2 a package on a batch of these suckers…but, you can use the leftover baked tofu over the week as it stores well in the fridge and goes great on a salad. Oh, and I strained my kimchi because it has a lot of liquid and I didn’t want my rolls to get too soggy. Preheat oven or toaster oven to 400F and line a small baking tray with parchment paper. Mix melted coconut oil and tamari into small bowl for tofu coating. 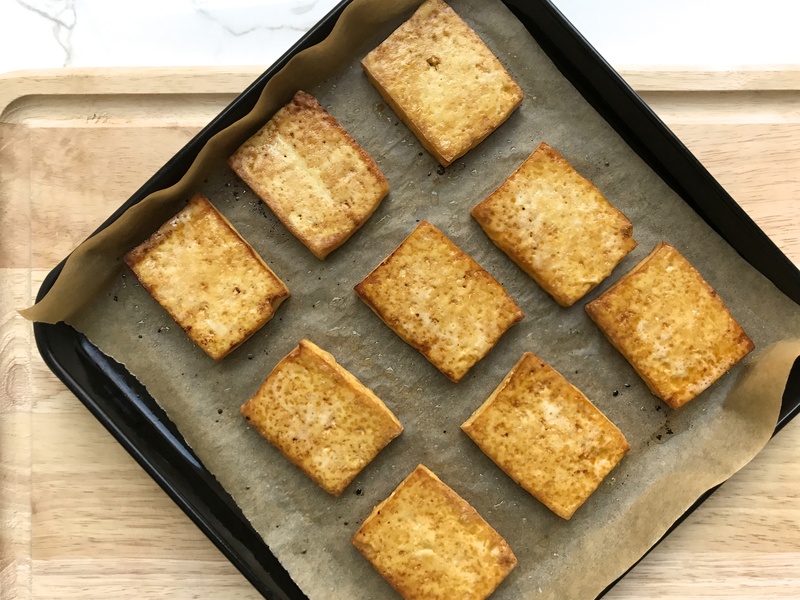 Slice tofu into ¼ inch blocks and brush with coconut oil and tamari mix. Place tofu slices evenly on baking tray and bake (flipping mid-way) for about 20 minutes until golden brown on both sides. 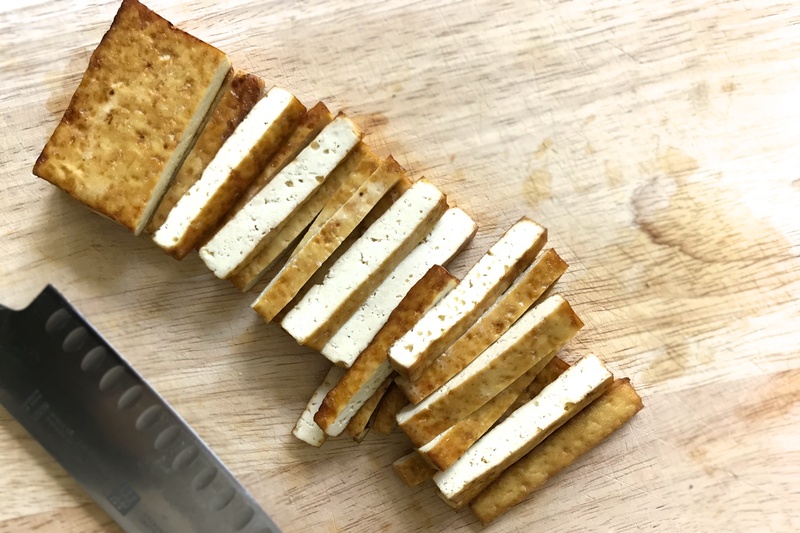 Allow baked tofu to cool before further slicing into thin, match-stick-like strips. 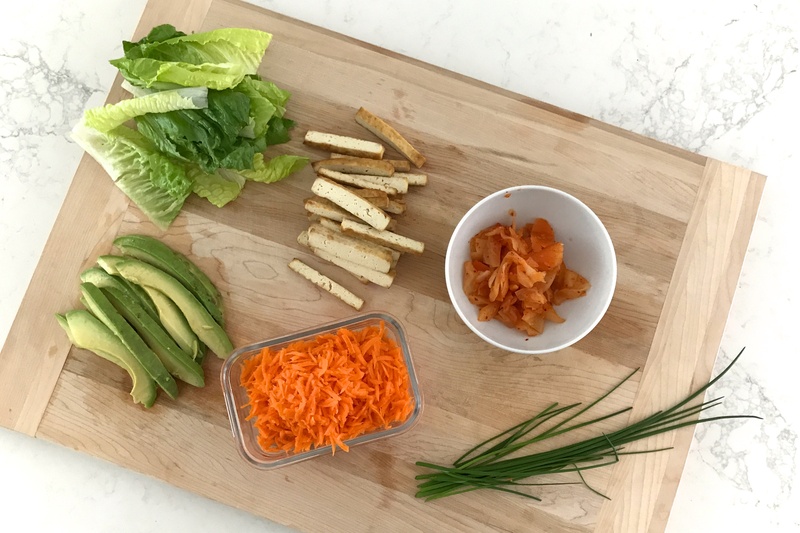 Gather all filling ingredients (lettuce, carrots, kimchi, avocado, chives, tofu) in one place for easy access. Fill a large mixing bowl or pie pan with warm water. Dip each, individual rice paper round into warm water for about 10 seconds until paper is just starting to get flexible and soft. Remove with both hands; let excess water drip onto clean tea towel and place flat on smooth surface. Place filling on the lower third of the circle of an individual rice paper in any order you like and roll into fat, cigar shape. Place seam-side down on a platter. Repeat x 12 and space the rolls with a bit of room in between so they don’t stick together. Slice in half or in quarters if desired. (Best to use a wet knife for this to avoid stickiness).Note: best served fresh, but can be kept overnight if wrapped, tightly sealed on platter with plastic wrap. Add all ingredients into a resealable glass jar and shake vigorously until miso dissolves and everything is fully blended. Keeps well in resealable glass jar up to a week in fridge. These Kimchi Summer Rice Rolls make a great dish for a summer party or picnic. If you’re going to make them ahead of time, they should be separated slightly on a parchment-lined platter to avoid “stickage” to each other or the platter. They keep well for about a day. To learn more about how I like to store foods and what my kitchen utensil essentials include, check out my ebook Fresh Start Kitchen. It’s jam-packed with life-changing and actionable information. 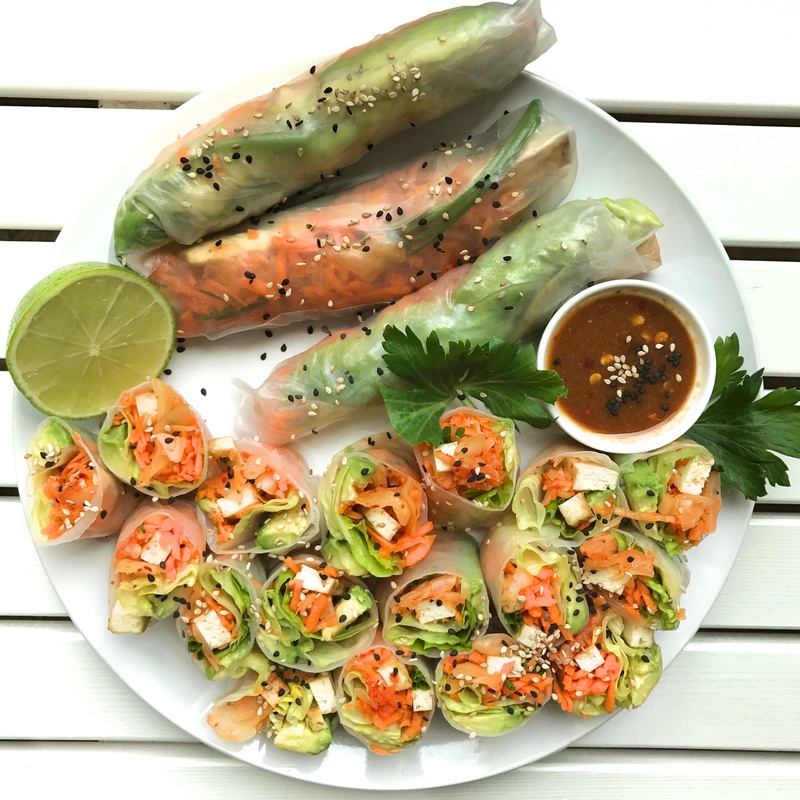 Would love to know if you make these Kimchi Summer Rice Rolls and what kinds of tweaks you make! 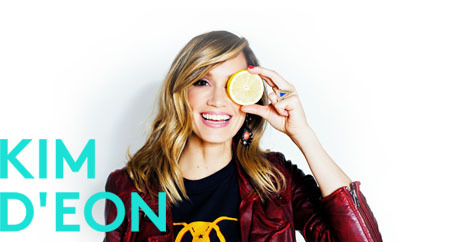 Snap a pic of your creations and hit me up on social media @kimdeoncom so I can see! Next article3 Recipes to Sneak in More Greens!